Bali- Bali is one of the provinces in the Republic of Indonesia with the other names being the Island of the Gods, Pulau Seribu Pura and Bali Dwipa. Bali has several small islands belonging to the province of Bali, including the island of Nusa Penida, the island of Nusa Lembongan, Ceningan Island, Serangan island, and Menjangan island. Bali has 9 Regencies in the City including Denpasar City which is the Capital of Bali Province, Badung Regency, Gianyar Regency, Klungkung Regency, Bangli Regency, Karangasem Regency, Buleleng Regency, Tabanan Regency, and Jembrana Regency. The history of the island of Bali is so much if told, from prehistoric times to historical times. Starting from a time when humans did not know the writing, entered the kingdom until the Dutch colonial era and Japan and the era of independence of the Republic of Indonesia where Bali consciously and voluntarily participated in recognizing Bali as part of the Unitary State of the Republic of Indonesia. 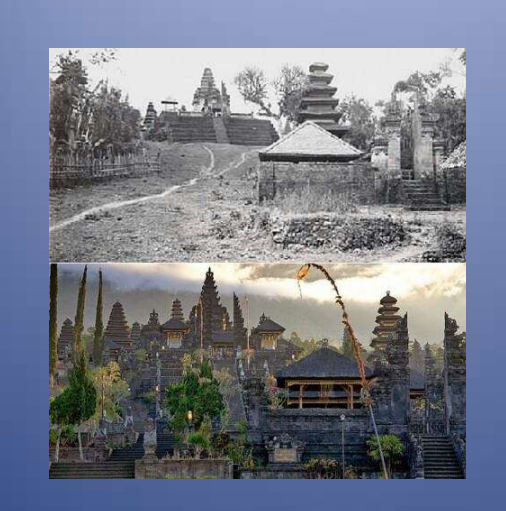 Remembering Bali in the past is a very pleasant fantasy, it's amazing that we can see the changes and developments of Bali from the past until now. Below is a book that describes Bali in the past, can be downloaded or read directly. Bali's development will continue, moving linearly with time. Nothing is permanent other than change. The period of changing times, tradition also continues to grow in line with the development of globalization, but it does not mean that Balinese culture will just fade away. Remembering history is the way we learn to continue how we bring Bali in the future. GWK- Maybe it's no stranger to you about the biggest statue in Bali. The statue that was built on a hill and takes a very long processing time. The statue is a statue of Lord Vishnu sitting on a Garuda bird. Vishnu is the manifestation of God with the function of preserving the universe and maintaining its balance. This 121 meters high Garuda Wisnu Kencana Statue (GWK) was built on an area of about 60 hectares in Ungasan Village, South Kuta District, Badung Regency, Bali. The discredited statue has a height exceeding the Statue of Liberty in America and takes up to 28 years in the process to complete it in August 2018 as a gift for the 73rd anniversary of the independence of the Republic of Indonesia. This statue was designed by a Balinese artist named I Nyoman Nuarta. The Garuda Wisnu Kencana tourist attraction or often referred to as the GWK Bali is one of the famous tourist attractions in Bali. 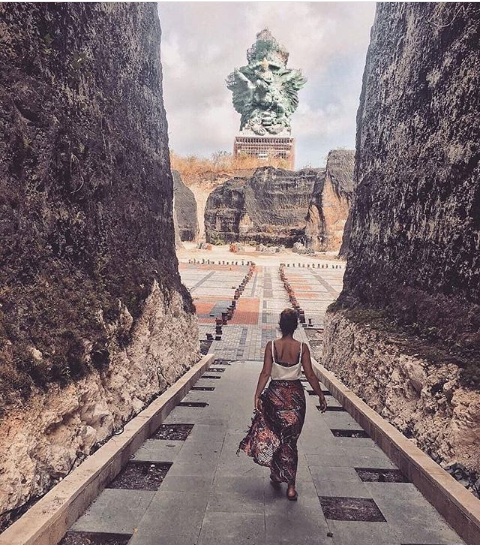 Almost every day the Garuda Wisnu Kencana Bali Tourism Object is visited by tourists, both domestic tourists, and foreign tourists because of its beauty, gran, and fame. It is incomplete if visiting Bali does not visit the Garuda Wisnu Kencana Tourism Object or called GWK Bali. The completion of the statue of Lord Vishnu who was riding a Garuda Bird and called the Garuda Wisnu Kencana (GWK) was officially opened by the President of the Republic of Indonesia Mr. Ir. Joko Widodo. Garuda Wisnu Kencana (GWK) is often used as an art venue in Bali and entertainment events are held to attract tourists to visit it. Become a pride and identity or icon for the island of Bali so that its preservation should be maintained. The Garuda Wisnu Kencana Statue (GWK) is located in Ungasan Village, South Kuta District, Badung Regency, Bali. From Jimbaran Village, head towards another direction about 1 kilometer. For those of you who want to visit GWK can follow the map below as directions. Bali - Some Indonesian artists choose the Island of the Gods as a place to start a new chapter in their lives by binding and saying the sacred promise as lively as they wished. Besides having a stunning view, they want their wedding to have a nuance that is unique to them in the hope that their marriage will last until death picks up. This event is a very sacred and valuable as a form of joy and joy of two people and two united families that must be shared with everyone, but there are some artists who choose to invite some of their people and close relatives who are considered important in the event without reducing the meaning of his marriage. The romance that had only begun for a few months did not prevent Chicco and Putri Marino from going to a more serious level. Their wedding was held at the Sofitel Bali Nusa Dua, on Saturday, March 3, enough to surprise fans. The wedding program looks very intimate and is attended by family and closest friends of each bride. 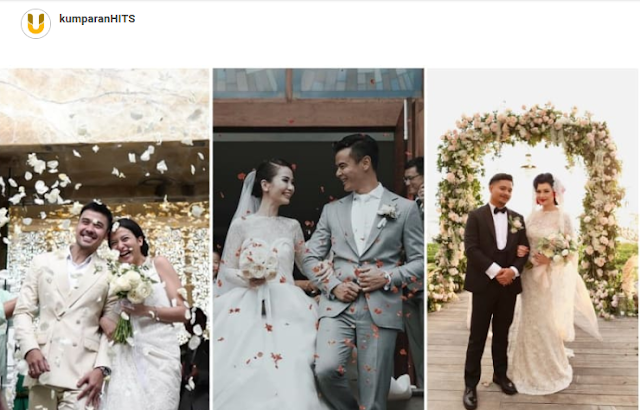 Some guests from celebrities who attended the wedding included, Rio Dewanto, Ridho Hafiedz, Baim Wong, Wulan Guritno, Atiqah Hasiholan, and guitarist Slank. Some invited guests who could not resist crying drifted in the intimacy of the wedding that took place right when the sun began to set. The atmosphere becomes even more romantic with the beautiful view of the sunset in Bali. It was seen in the video uploaded by Chicco on Instagram that they were so happy and very lively. It was so prepared and Bali became their port as a place to carve out a new history. After establishing a love story long enough in the dating process, Dion and Fiona are determined to go to a more serious level for the future of their relationship. They held their wedding blessing at the Church of Santo Fransiskus Xaverius, Denpasar, Bali on Friday, September 1, 2017. The blessing of the wedding began at 12.00 WITA. Wedding dress suits make them look more handsome and beautiful. Dion, who wore a gray suit from designer Wong Hang, looked closely at Fiona, who at that time used a white wedding dress from the designer Hiantjen. In a happy atmosphere, they shed their tensions because they enjoyed the procession of their marriage when they made a promise to live in front of the Altar and before the Pastor and all the people in attendance. "I am Fransiskus Xaverius Dion Wiyoko accepts you Florencia Fiona Anthony being my wife. I promise to be faithful to devote myself to you in harmony and misfortune, in joy and sorrow, in health and illness. I want to love and respect you all my life," said Dion while holding Fiona's right hand. They chose Sofitel Bali Nusa Dua as a reception venue after the wedding ceremony which was attended by 100 invited guests. Villa Ombak Biru, Badung, Bali became a historical place for Derby Romero and Claudia because on Saturday, October 14, 2017, they officially became a married couple. Wedding parties held on the seafront take place beautifully, romanticly and solemnly. The wind and waves crashed into the couple's wedding party had been dating for 2 years. Their wedding program was also held closed and only attended by family and close relatives. In the video uploaded by Derby on his personal Instagram, seen Derby using a black suit, holding his wife's hand while making a sacred promise. They also carry a vintage concept at their wedding. Some of the celebrity guests who were present were Aming and Rossa. The marriage between Sammy and Viviane was held at The Edge Uluwatu, Bali on Saturday, July 22, 2017. The blessing was held at 16.00 WITA before sunset. The wedding party with the theme of classic elegant and outdoor concept was held in a closed manner. The second place binds the sacred promise dominated by white complete with the open sea as a sight. Ivan Gunawan made Viviane's wedding dress making Viviane look beautiful with her wedding dress and Sammy used a white suit made from the Fashion House of Brutus. The wedding was not attended by many guests to be more sacred. They only invited 100 family members and close relatives to be witnesses when they made a faithful pledge of all life. On Monday, 8 August 2016 at Ayana Resort and Spa Bali Samuel and Franda were legally married. The wedding event took place solemnly and romantically. A sense of nervousness arises for Samuel when he will make a blessing, but he can overcome it considering the event must go well and is a historic and sacred event for him. Bali has an extraordinary appeal for everyone, so many public celebrities who want to visit Bali even want to carve out their life history in Bali. Not only homeland celebrities often visit Bali, but World celebrities also often vacation in Bali and even hold their weddings in Bali. heard his name already imagined how much beauty and uniqueness that existed on the Island of the Gods. A million beauties owned by Bali make all travelers always want to visit. With a natural appeal with the beauty of the beach, hills and culture make a strong trap for all domestic and foreign tourists. Many vacation spots in Bali, but for those of you who are on vacation, you must visit Nusa Penida. Nusa Penida is located in Klungkung Regency is one of the 3 Nusa owned by Bali after Nusa Lembongan and Nusa Ceningan. Nusa Penida Island has an area of 202 hectares. The most favorite vacation spots in Indonesia are of course in Bali. Bali ... yaps ..
A million beauties owned by Bali make all travelers always want to visit. With a natural appeal with the beauty of the beach, hills and culture makes a strong trap for all domestic and foreign tourists. Many vacation spots in Bali, but for those of you who are on vacation, you must visit Nusa Penida. Nusa Penida is located in Klungkung Regency is one of the 3 nusa owned by Bali after Nusa Lembongan and Nusa Ceningan. Nusa Penida Island has an area of ​​202 hectares. The scenery in Nusa Penida is as impressive as the scenery at other tourist attractions in Bali. Having a beach with clear sea water and is a great place for snorkeling and scuba diving are things that make this beach visited by many tourists. This beach is named Crystal Bay Nusa Penida. Because it has clear sea water so that the underwater beauty is clearly and amazingly seen, tourists visiting this place approach it with Crystal Bay. Beachside salvation is supported by the many coconut trees that make this beach look very natural, beautiful and beautiful. Being a paradise for tourists who come here for snorkeling and scuba diving because they will be very satisfied to be in this place. A variety of colorful fish hide behind the beauty of coral reefs that are still preserved. Not only has a beautiful underwater view, but this beach also has impressive land views with beautiful and wide sand, and is surrounded by small green hills and small atolls. Visit Crystal Bay Nusa Penida, tourists will be able to feel a very calm atmosphere. There are also interesting spots to be able to witness the beauty of nature in Crystal Bay. To get there, there are hundreds of steps that must be passed. But after climbing the stairs, you will be able to watch the Crytal Bay view in full. Starting from the existence of atolls, temples that are not far from the beach area and the presence of Nusa Lembongan and Ceningan Islands can also be witnessed. Being in Nusa Penida is not only in Raja Ampat Papua, with clear sea water, there are also small islands. No doubt Nusa Penida got the nickname Raja Ampat in Bali. Crystal Bay Nusa Penida is located about 15 Kilometers or less, around 20 minutes from the Port of Nusa Penida is a beautiful beach located in Penida Bay. This beach is precisely located in Banjar Penida and is part of the Sakti Village area. To get to the location of Crystal Bay Nusa Penida is quite easy. First, of course, the traveler must go towards the Port of Nusa Penida. From there, the trip can continue the journey to Toya Pakeh. Later, there will be a climbing route to Sebunibus that must be passed. When you arrive at the Sakti T-junction, a traveler can choose to turn right, to the Banjar Sakti. From here, the trip was already quite easy and later it will be seen clearly Crystal Bay with its fast waves. Pantai Kerobokan- Kerobokan Village is a village located in North Bali, precisely in Sawan District. Kerobokan village continues to improve its tourism, the new potential of Kerobokan Beach is the excess sand beaches that can be used as a health therapy. Starting from most people who come to just hoard their feet while enjoying the beauty of Kerobokan Beach, but there are other benefits obtained after hoarding the legs. Moving on from that, many people from outside the Kerobokan area want to try to hoard their feet and bodies to get healthy or restore health. Kerobokan Beach was visited by a team from the Research and Community Service Institute (LPPM) of Udayana University (UNUD). The team observed and took black sand samples on the beach as research data. As a result, black sand along the coast of North Bali can be used as a health therapy. 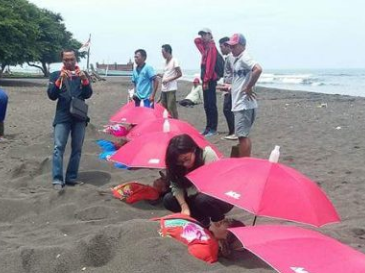 The UNUD LPPM team noted black sand in North Bali can produce heat with a certain temperature. This heat can be used as a health therapy. One of them, the research was carried out on the coast of Kerobokan Village, Sawan District, Buleleng, in 2017. From the results of the study, it is known, with the heat of sand between 45 degrees to 50 degrees can be used as a healthy alternative. The opportunity can be done starting at 9:00 a.m. until 5:00 p.m., with a maximum depth of sand excavation of 50 centimeters. The time period needed is not too long, only lasts for 15 minutes. Then the recovery period after rising from the sand pile needs 5 minutes. The research indeed continues, until it is known with certainty what diseases can be cured with black sand therapy. But empirically, residents have been accustomed to using black sand for health therapy.